Ullswater is the second largest lake in the English Lake District, it gently curves through eight miles of beautiful mountain scenery and is an ideal location for a day or two's paddling. 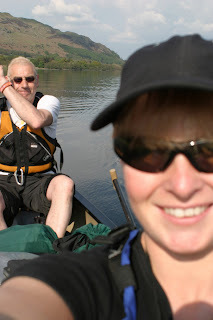 We arrived just before midday at Pooley Bridge at the northern tip of the lake. Not knowing the area we decided to pop into the local tourist info centre to find out about access and camping. They were so helpful. We found out there were countless lay-by’s where we could leave the car and most had little paths leading to the water edge, ideal for launching our 16-foot mobile adventure canoe. We were given a leaflet called "ULLSWATER, A LAKE USER'S GUIDE which outlined privately owned land and the public access area's, which saved us any awkward farmer/paddler situations. We parked our car in a large lay-by just past the Ullswater Outward-bound centre on the A592. Just as they said, there was a short path leading to a lovely pebbly beach where we kitted out our canoe and started our trip. The weather was stunning and the lake was mirror like, a far cry from the wind and rain we had left only a few hours earlier in Wales. We paddled, well more like glided down towards the southern end of the lake. We came across a beautiful little island covered in bluebells and blossom. Our map said it was called Norfolk Island and stated quite clearly that landing on this island was prohibited during April and May. Curiosity got the better of us and we paddled in close to see what was so special. We didn't land and we couldn't see anything from the boat so we carried on our way towards the village of Glenridding. Looking over to the opposite side of the lake we saw the most picturesque camping spot imaginable. It was surrounded by trees, with its own little beach. It even had grass to pitch a tent and a tiny stream for water. It was perfect, until I checked the map and by my reckoning it was just on the boarder of some private land. It was a shame but I didn't fancy trespassing so on we paddled in search of our bivvy site. We passed an official campsite at the very end of the lake which looked lovely but i fancied a bit of wild camping so we did a U turn and made our way up the other side of the lake. We soon came across the idyllic spot we'd seen earlier. Imagine how I felt when i saw 2 canoes and a tent pitched right there. Had my map reading been that bad? Slightly disheartened we continued up the lake, passing the other side of Norfolk Island (still couldn't see anything on there) and landed on a little stony beach, which was to be our camp for the night. There was no grass to pitch a tent so we opted for a tarpaulin tied between two large rocks, we put our mats underneath and hoped it wouldn't get too cold during the night. We decided to stretch our legs a bit and climbed the steep grassy slope, which towered above the beach. It was a hard scramble trying to follow old sheep trails but well worth it. From the top we could see the entire lake and the golden sands of silver point, which was literally round the next corner but had been hidden from our camp. It was at this point, as I was admiring the view and crouching for a desperately needed pee, that I discovered something I'd never seen before, a 'Sheep Tick'. There on my thigh with its head firmly stuck in my leg and quite oblivious to the horror it was causing. I gave it a swipe but it didn't budge. I suddenly had flashbacks to my childhood where I remembered being told never to pull them straight out as there heads come off and rot and festered under the skin. So what was I to do, I really didn’t want to shout for help as I wasn't really appropriately dressed. I finally found two small pieces of wood and made a sort of clamp around its bulbous body, I took a deep breath and twisted and pulled hard. It came out intact, still wriggling its little black claw like legs. What an experience. I was really quite glad to get out of the grass and back that lovely pebbly beach. The light soon faded and it did get a little chilly, so I snuggled up in my sleeping bag to eat my instant mash and baked bean supper. Then out of nowhere we heard faint screeching and squawking and it was coming our way. Within minutes the entire of Norfolk Island, which was about 1/4 mile from our beach, was covered in Cormorants. You've never heard anything like it. Again we thought about the idyllic spot, which we'd missed out on because of my mistake and how we were unlikely to get any sleep if this racket continued. Then, just above the noise of the birds we heard voices. It was pretty dark but we could make out the shapes of two canoes paddling speedily along with the occupants having an almighty argument. To our delight (sounds cruel I know) it was the idyllic camp pinchers, who had been moved on by the farmer who I expect deliberately waited until nightfall to express his feelings for maximum effect. With my map-reading prowess restored we decided to get some sleep. The bird’s squawked on and off all night but we soon got used to it. However, what did keep me awake was the thing I felt crawling inside my sleeping bag in the middle of the night, which went crunch when I hit it. I didn't have the nerve to look to see what it was. We were woken about 6.30am by the chorus of Cormorants flying off into the distance, a pretty magnificent sight even at that time in the morning. The lake was covered in a low mist, which chilled the air but filled us with a sense of awe at the magical landscape, which lay before us. After breakfast and after washing the silvery slug trails, which had appeared in my hair overnight, we launched the boat once more and headed towards the northern end of the lake where we hoped to get some lunch. Just over half way along the lake is Howtown, a delightful little village that is a landing point for two 19th Century steamers! Our map said keep clear of them; give them right of way near the piers and to avoid collisions. Pretty sensible if you ask me. 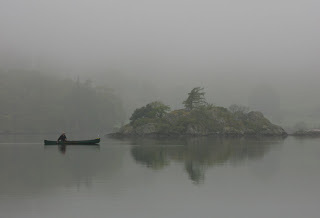 To reach the end of the lake you do have to paddle past a steamer pier, which is scary, especially in the mist. The don't slow down for you so paddle fast and be prepared for a huge wake which follows behind them. By lunchtime we had reached Pooley Bridge but the weather had turned wet and windy so we decided to ditch the lunch idea and make our way back to the car. The wind started to increase a bit so we put our sail up, laid back and enjoyed the scenery. We could see the tiny silhouettes of people making their way down the surrounding mountains trying to escape the thickening cloud. There were a few fishermen on the lake, one of which told us of an unusual fish called a SKELLY, some sort of freshwater Herring apparently, which lived way down in the deepest parts of the lake. You learn new things every day!It wasn't long till we were back at the car. We'd only been gone 24 hours but I honestly felt as if I’d been away on holiday all week. If you have a couple of days off and feel the need to get away from it all then Ullswater is definitely the place to go.